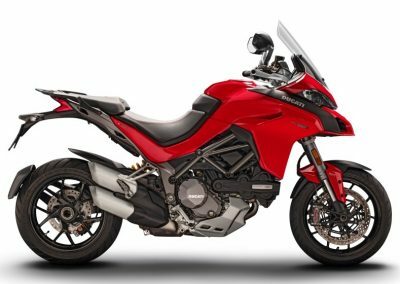 Ducati Multistrada 1260 S (2018) for hire from RoadTrip. We have a pair of 2018 Ducati Multistrada 1260 S machines on our fleet. The Multistrada has evolved consistently since its release in 2003 and the 1260S model is the latest version of this iconic motorcycle. The machine is packed with improvements over its predecessors. The Ducati Multistrada 1260 S is powered by the revolutionary Testastretta DVT engine. The desmodromic variable valve timing manages both exhaust and intake performance. This optimizes power and torque across a wider rpm band and reduces fuel consumption. The re-engineered 1262 cc version now delivers more power at lower engine speeds. 85% of available torque is accessible at 3500 rpm and at 5500 rpm it is 18% higher than the outgoing 1200 cc motor, which is a remarkable improvement. The 1260 S is the first Ducati Multistrada to be fitted with the Ducati Quick Shifter (DQS). This permits clutch-less gear changing up and down the six-speed box. The Multistrada 1260 S’s electronic performance and safety packs are best of breed and assure a dynamic, sure-footed ride, whatever the road and riding conditions may be. 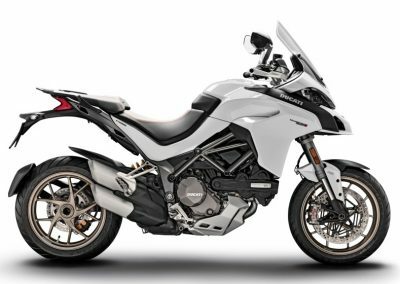 The Multistrada 1260 S is fitted with Ducati’s electronic Skyhook Suspension (DSS) Evo, which adjusts the ride by the millisecond. 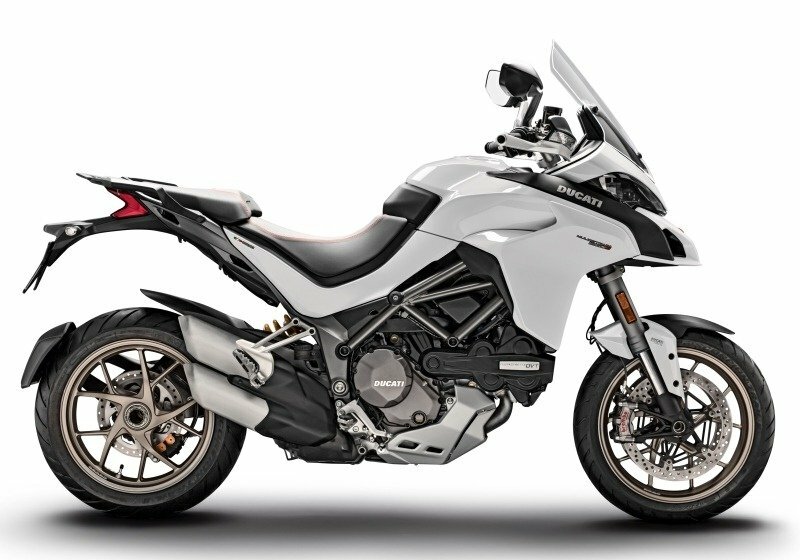 This was developed by Ducati with Öhlins and first seen on the 2013 Multistrada. Brembo ABS brake callipers are fitted to front and rear discs. The ABS is enhanced by cornering (lean) sensors, and the safety pack also includes wheelie control, Ducati Traction Control (DTC), vehicle hold control and cornering LED headlights. Four electronic riding modes (‘sport’, ‘touring’, ‘urban’ and ‘enduro’) transform the Multistrada’s character and capabilities by adjusting a wide range of performance and safety features on the move, at the flick of a switch. Sport and touring modes offer the full 158 bhp. Urban and enduro modes reduce horsepower to 100 bhp. The Ducati Multistrada 1260 S is made with touring and rider comfort in mind. This model has a longer wheelbase and swing arm and more aerodynamic bodywork for enhanced stability at speed, even with luggage and when riding two-up. Heated grips, an adjustable screen, centre stand, cruise control, backlit handlebar switches, full colour console and adjustable rider seat height are all part of the new touring package. We have also fitted Ducati engine protection bars for added security. Our Ducati Multistrada 1260 S motorcycle rentals are finished in a choice of Ducati Red with black wheels and Iceberg White with gold wheels. Matched Ducati luggage hire with liner bags and SatNavs. are also available. 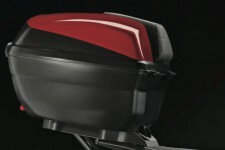 Side Panniers by Ducati: 56 litre capacity. Colour co-ordinated, lockable hard cases that are secured to the motorcycle with an integrated quick-release locking system. With carrying handles. Internal liner bags supplied. Rear Top Box by Ducati: 48 Litre capacity, colour co-ordinated, lockable, hard topcase. Secured with integrated quick-release locking system. Room enough for two helmets. Supplied with a liner bag. SatNav: Tom Tom Rider V Sat. Nav. with up-to-date European mapping is available to hire with this motorcycle.